Heard the news today that the Seattle Rock and Roll 1/2 (and Full...) Marathon has sold out. Had a tiny panic that I hadn't registered, but indeed I have. I love to see a summer race calendar fill up! April will bring a couple of runs in Texas while I"m on location (note to self: bring water!) 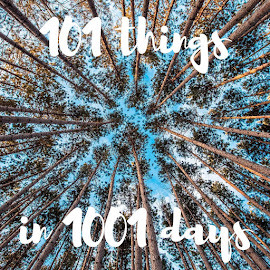 and hopefully this month I'll hit my goal of 50 miles. 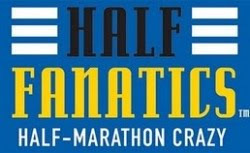 Also I'll enter the "race taper" (ha) for the Vancouver Half Marathon on 5/2. Next event: probably the Top Pot 5K on April 25! Got to run with my best friend again today. :) Wil got us up promptly -- I toasted some bagels while Wil dug out the water bottles. I was a little worried about Wil -- after all, since hurting his foot in December, he has struggled through a half and a full marathon, and run one other time. And today I was determined to run my scheduled 10 miles. I was actually looking forward to running my favorite loop -- 2.5 miles down to the Fremont Bridge, then 6 miles around the Cheshiahud Loop, and then the 2.5 miles back home. The morning was bright (if not yet sunny), and we headed out before 8:00. And, of course Wil was a total superstar, and he had no problem finishing the run. Which makes me both happy (yay for having my running buddy back!) and furious (I don't think I would have been able to comfortably finish a 10-miler after a 3 month break. Grrr! ), Hee hee. Ran this morning -- in a desperate attempt to get some miles under my feet. Ran on the treadmill at work, wearing a pair of capris that are clearly made of synthetic "wicking" fabric. And, well, let's be honest. I'm not one of those girls whose thighs don't touch. So when running in synthetic capris... apparently a bit of static electricity builds up. I should point out that this has never happened before. But as I plodded along, I noticed that occasionally I felt as if I was getting poked by the treadmill. I thought perhaps there was a sharp spot on it somewhere. I do happen to run a bit too close to the front of the treadmills, which means that I bump up against the "safety bar" or whatever you want to call it. And every time I touched it with one of my legs, I got a little shock. Yes, that's right. I was building up up static electricity, With my thighs. Man. How lame is that? Lindsay tells me it's because I was running so fast. Basically forced myself out of bed and into my shoes this morning for an 8-mile run. Felt okay for the first few miles, but struggled a bit in the last two when I had to run back up all those hills I happily ran down to the water. Oh well. Also should have brought water -- luckily the water fountain at Golden Gardens works even in the cold. Gulped some down, swallowed a few Sports Beans (candy!) and felt better most of the way back. Speaking of back, my back started to hurt towards the end of the run. That's something new and weird. 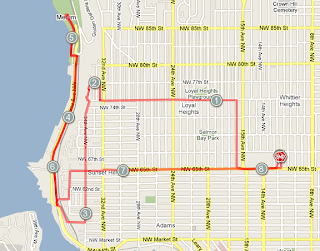 Anyway, here's a picture of the run -- nice to have found a decent 8-mile route. That has always eluded me before. Didn't manage to run on Tuesday, my "usual" day... so forced myself to go to the work gym this morning. Nothing of any interest to report.... 5.88 miles. Ran this morning with my best friend! :) Due to Wil's foot injury, he hadn't run in quite a while. Meanwhile, I had been slowly logging solo miles -- some in the real world, some on treadmills. But today Wil decided to join me. Because I didn't want to push it too far on his first run back, we decided to run to the lookout and back -- 4 miles rather than the 6 miles on the training calendar. I probably needn't have bothered. We walked to 15th and waited at the crosswalk, and then started our watches the the light turned green. We ran the short block to 16th, and then turned to run up the hill. Half a block up and I was already sucking wind trying to keep up with fleet-footed Wil. By the time we hit 70th I was several paces behind and felt as if I couldn't breathe. Wil was just motoring along. By 73rd I needed to slow to a walk so I could catch my breath. Wil just carried on. Sigh. I rallied and managed to keep up for the rest of the run, though, so that's something. My favorite part of the run -- holding our breath as we ran through a blizzard of cherry blossoms. Now that we're home, stretched, and showered, the sun has gone away and the blue sky has been replaced by gray. Looks like we managed to get outside for the nicest part of the day. Ran this morning before work on the treadmill. Didn't manage to run yesterday, but I didn't want to put it off another day to get on my usual schedule. Then again, if one doesn't actually follow the schedule, is it really a schedule? Anyway, ran 5+50+5, feeling pretty good most of the time. Except for when the weird stairmaster lady came in. Dressed in jeans and a sweater, she walked in, turned on all the fans in the room, and then went over to the stairmaster and proceeded to have an upper-body workout. You know what I mean -- she just held herself up on her arms and wiggled her feet a little. She would do that for 30 seconds or so, then dismount, turn around backwards, and do that again. Another 30 seconds, she would dismount, face forward, etc. Wiggle, turn, repeat. So weird.